This LEGO City building kit contains new roads for your town. 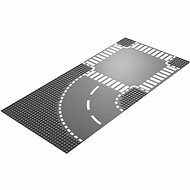 The kit includes one T-junction plate and one curved road plate. If you've been wondering how to expand your town, building new roads would be a good start. Your racing and passenger cars or fire trucks need something to drive on to get to their destination and you can turn your small town into a large, modern city with terraced buildings, playgrounds, shopping malls, entertainment centres, police and fire stations, and hospitals. Build the roads and the rest will follow. 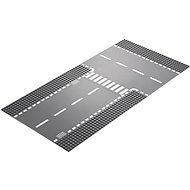 For shipping to other EU countries visit this page LEGO City 7281 T-Junction & Curved Road Plates. 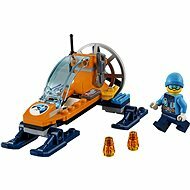 Für Versand nach Deutschland, besuchen Sie bitte LEGO City 7281 T-Kreuzung und Kurve. Chcete doručit zboží do Česka? Prohlédněte si LEGO City 7281 Křižovatka ve tvaru T a zatáčky. Chcete doručiť tovar na Slovensko? Prezrite si LEGO City 7281 Križovatka v tvare T a zákruty. Für Versand nach Österreich, besuchen Sie bitte LEGO City 7281 T-Kreuzung und Kurve. Magyarországra történő kiszállításért tekintse meg ezt a termékoldalt: LEGO City 7281 T-elágazás és kanyar.